EDWARDS AFB – School’s out for the summer but the learning hasn’t stopped. The Edwards AFB Library is keeping kids busy with its fourth annual Department of Defense sponsored summer reading program. The program includes a special one-hour presentation on Friday mornings that is open to all ages. 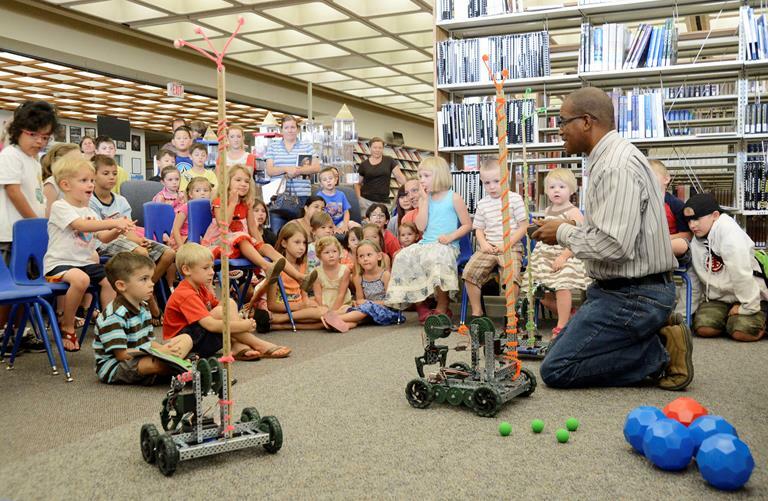 The July 19 event was a robotics demonstration presented by the 412th Test Wing, Science, Technology, Engineering and Mathematics outreach director, Mickey Bowen. Bowen brought several robots, including VEX, NXT and calculator robots. The majority of his demonstration was done with VEX Claw bots that have a moving claw that opens and closes. The robots are operated using a control system similar to an Xbox controller with a range of up to 300 feet. Each controller was color coded to match its individual robot. The students were taught how each controller sent messages to an individual motor just like the human brain can control the body. By the end of the hour, students were able to observe that it takes the whole system of the motor and controller to create a robot. Following his demonstration, Bowen invited the children and their parents to try the robots themselves. They also worked on a project that required students to discover how to make a paper boat, made from a skimmer with a cell on it, move across a table top. The goal was for them to find ways to improve the boats distance and ability to stay on course by changing factors like force and weight. According to Alison Vasquez, the library director, the presenters for the summer reading program are usually volunteers from base. So far this summer, they have had a LEGO demonstration, a security forces K-9 Unit demonstration and various crafts. The library will have visits from the Health and Wellness center and a Zumba instructor before the summer ends. Each year, the reading program offers incentives, which correspond with the theme, to children that read a set number of books. This year, the theme is “Have Book, Will Travel” so the prizes include items like a sling pack or a travel journal. Vasquez said the program has grown significantly since last year. The previous summer, the library reported around 9,100 books completed cumulatively in the 10-week period. This year, after only seven weeks, the total has surpassed 7,000 books. “We hope to get to the 10,000 mark this year,” she said.